I remember when I was little, my grandmother always made melon balls out of her watermelons and cantaloupes instead of just cutting them into chunks. Even as a kid it registered for me that she was putting just a BIT more love into her food, and it’s one of my fondest memories of her to this day. So just imagine if she’d made a flippin’ GIANT BEACH BALL COOKIE COVERED IN FRUIT. Or a crab sandwich… literally! This is the stuff that memories are made of… and of course will impress the heck out of any summer party guest, too. : ) Here are 5 great beach party food ideas! 1. “Crabby crabwich” via FamilyFun Magazine – with baby carrot legs, red pepper claws, and black olive eyes. Great for under the sea or pirate parties! 2. Starfish s’mores via Hungry Happenings – made with homemade marshmallows and candy eyes. Cuteness! 3. “Pearly bites” cookies via Spoonful – super sweet for a girlie beach party! The pearl inside is a yogurt-covered raisin or peanut. 4. Giant beach ball sugar cookie via Hungry Happenings – Pillsbury cookie dough, pre-made cheesecake filling, lemon curd, and whipped topping are all hiding under that yummy fruit. 5. 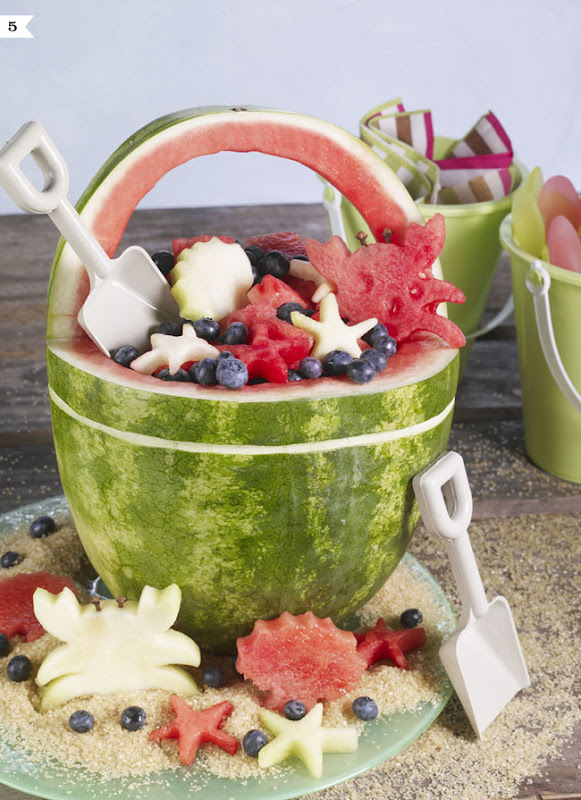 Watermelon beach bucket via the National Watermelon Promotion Board – so clever and (maybe) not even so hard to make! The crabs and other critters are cut out with beach theme cookie cutters. Thanks so much for posting links to two recipes on the Hungry Happenings blog. I'm thrilled you liked my ideas. I absolutely love the "Pearly Bites" and the watermelon beach bucket and am happy to have my ideas in their company. These are fantastic! I think I could even make those "pearly bites"! I think I will definitely have to try those starfish cookies!! Yum, s'mores!! These are adorable! 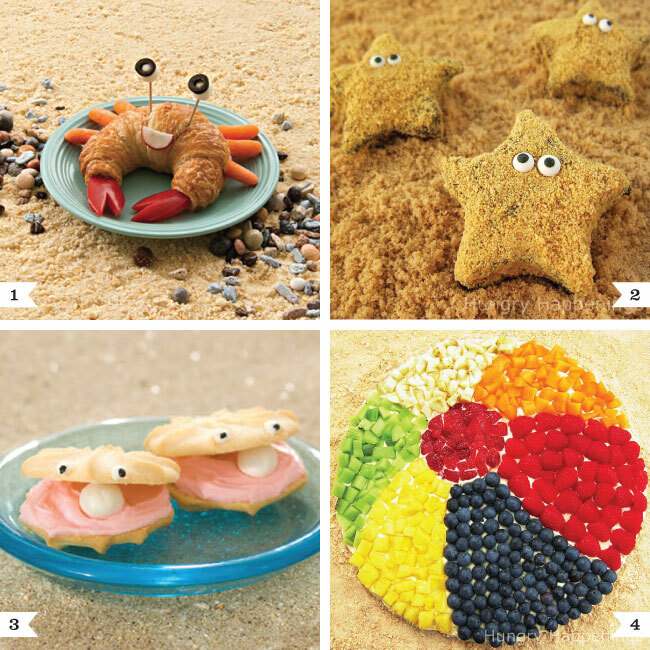 We go to the beach every summer, I can't wait to make these fun treats for the family! I love the beach party ideas. I would love to see more. I am planning a beach themed part next month for a 14 year old and I am definitely making the cookies. Cute and simple idea. Thank you. Please do! : ) Seriously, what did we ever do without Pinterest?! That's so odd, it works for me! But I'll add it since it seems it may not work for everyone. Thanks! Where did you find the crab cookie cutters used in the display? I've bought two on Amazon, but neither one work. Just looking for advice. Hi Deb! I didn't make the crab cutouts, it's a picture from the Watermelon Board.